Thanks for writing! I'll get back with you ASAP. Feel free to call or to send a text message to me. Posts by Category Select Category 63021 for Sale Antebellum Homes For Sale Appraisals Around Town & Countryside Book Recommendations Chesterfield Homes for Sale Cindy’s Listings & Updates Closing Costs Defiance Homes for Sale Florissant Homes for Sale Foreclosures: General Information Foristell MO 63348 Homes for Sale Gardening High End Homes Lindenwood Park St. Louis Hills Southampton Local History Mehlville Homes for Sale Old Jamestown Open House Page Extension RE411 Refinancing Selling Your Home Statistics Uncategorized VA Second Tier Loans Villas in West County Wentzville MO Homes for Sale What Sold Yesterday in St. Charles County? 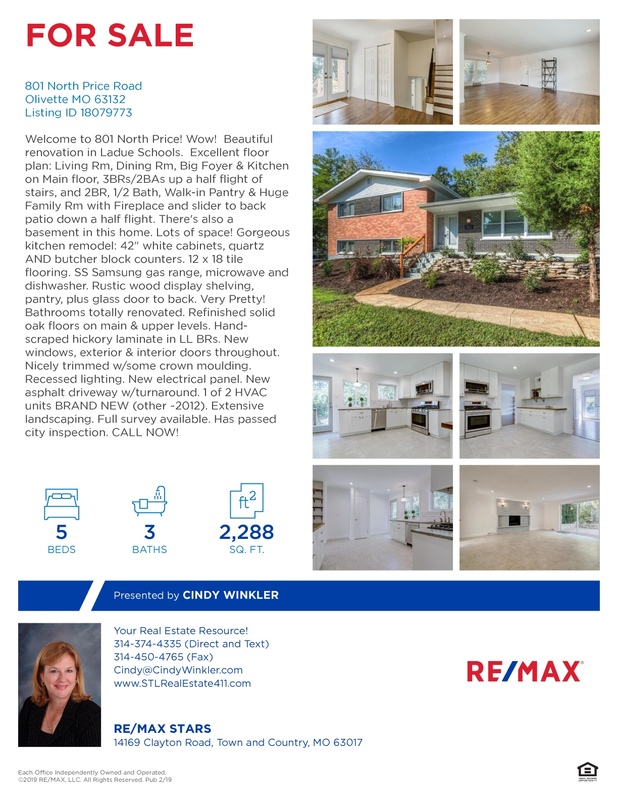 801 North Price Road ~ Ladue Schools ~ Beautiful Rehab! Please Click Here and “Like” My Facebook Page!